February 14 is Valentine’s Day—a day for chocolate, roses, and romance. But my Valentine was winging his way to Vienna for work. (I know. But someone has to do it!) So for me, there was no chocolate. No roses. No romance. (Full disclosure: we did share a heart-shaped pizza a couple of days before he left and exchanged eCards on the day.) Ordinarily a holiday would be a great blog post, but I didn’t feel much like writing about the history of the day meant for kisses and sweet nothings. Although I could have played up the really gory aspects—beheaded priests and all that (True story. But maybe next year. )—I decided to see what else happened on February 14 (besides the St. Valentine’s Day Massacre, which has been done to death [Rimshot!]). And there it was on the History Channel’s This Day in History website: February 14, 1929—Penicillin Discovered. Awesome. 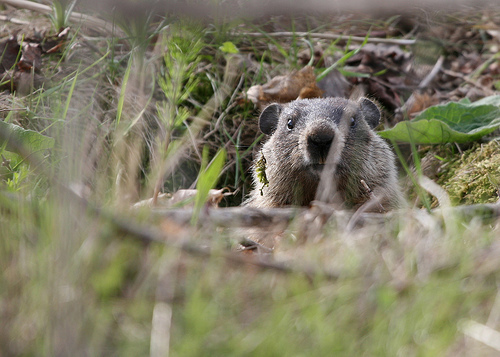 I can’t take it—I’m allergic—but I can write about it. 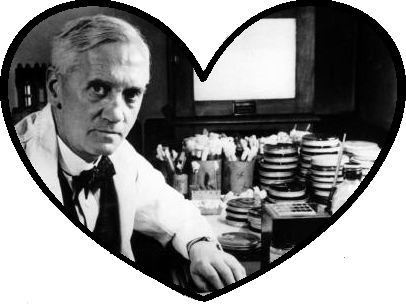 So, as any good historian would do, I began to investigate the facts of this premise: penicillin was discovered by Alexander Fleming (1881–1955) on Valentine’s Day in 1929. The trouble began with the sources. I could find dozens, hundreds and thousands even, that made similar claims to the History Channel, but I couldn’t find any primary source material to back it up. Digging deeper, I determined Fleming had actually made the discovery in September 1928. He was studying bacteria at St. Mary’s Hospital in London, England, and he noticed odd patterns in one of his cultures that had been contaminated by spores of Penicillium (likely from another lab in the building). The Penicillium mold prevented the Staphylococcus bacteria from growing in an area around the spores. Further experiments by Fleming followed, and he learned that the mold was harmless to animals and prevented Staphylococcus growth even when diluted. He also noted that the penicillin (Fleming’s name for the active substance) was not very stable because it quickly lost strength. Obviously then, Fleming did not discover penicillin on Valentine’s Day. I returned to the sources. Some said he actually “announced” the discovery on February 14. Possible. I started a new line of research. Perhaps his first paper on the subject was published on February 14, 1929. Again, I was stymied. Fleming’s work first appeared in The British Journal of Experimental Pathology, which helpfully noted the article had been “received for publication May 10, 1929”—definitely not Valentine’s Day. More research followed—for me and for penicillin. I read about the other investigators who helped to develop penicillin, including Oxford University researchers, Howard Florey (1898–1968) and Ernst Chain (1906–1979). In a collaboration that began in the late 1930s, Florey and Chain (and others in their lab) purified penicillin and discovered therapeutic uses; however, production and scale were still issues, especially with the start of World War II (1939–1945) in Europe. These problems would be solved in partnership with a lab in Peoria, Illinois, and large scale production would go on to save many soldiers from infection during the war and many civilians in the years after. ** Fleming, Florey, and Chain won the Nobel Prize for Medicine in 1945 for their contributions. Fleming, a modest man, remarked: “I did not invent penicillin. Nature did that. I only discovered it by accident.” But it would probably be more accurate to say he rediscovered it. It turns out that Fleming was not the first person to note the abilities of Penicillium! Others had witnessed molds’ healing ability, including a medical student, Ernest Duchesne (1874–1912), whose thesis, “Contribution to the study of vital competition in microorganisms: Antagonism between moulds and microbes,” also considered the therapeutic values of molds. The year? 1897. And there were others before Duchesne. Unfortunately for modern medicine, Duchesne died before he could continue his research, and Duchesne’s work went largely unnoticed at the time. It took Fleming and his contaminated sample to get the idea noticed. But not on February 14! I searched again, trying to find the “patient zero” for the History Channel article. Who had Fleming told on February 14? His wife? The milkman? The story must have started somewhere! I mentioned the problem to my husband (a scientist, but not a bacteriologist) via a Skype chat (because remember he is still in Vienna, poor thing!) and asked him where a British scientist might make such an announcement. He suggested the Royal Society. And I was off pulling another thread in my attempt at unraveling the Valentine’s Day conundrum, even though my research had now run to dozens of hours over several days. “Why bother?” You ask. Because (A) I’m frustrated by unsolved mysteries, (B) misinformation irritates me, and (C) I’m stubborn. (Full disclosure: friends and family would probably say it is mostly C!) So now it was a matter of principle! Alexander Fleming presented some of his work on penicillin at the Medical Research Club in London on February 13, 1929. That’s right. The day before Valentine’s Day. Where the Valentine’s Day mythos began is anyone’s guess. Perhaps someone thought it would be funny if the antibiotic that cures some sexually transmitted diseases was discovered on Valentine’s Day and fudged the date. Perhaps the initial error was a typo. Perhaps, it was lazy research. Regardless, the premise that penicillin was discovered (or even announced) by Alexander Fleming on Valentine’s Day in 1929 is completely debunked. Sorry History Channel. I know it’s a bitter pill to swallow. Photo: Alexander Fleming in his lab. Original via Wikimedia; edits Rebecca Bigelow. **On a personal note, penicillin came to the market too late to save my uncle (on my father’s side) who died in 1931, at the age of six, from complications from strep throat. Penicillin probably would have saved him, but 1943 was the year mass production of penicillin began—coincidentally, the year my father turned six. The History Channel website article that started this quest. One of the many sites that said Fleming “announced” the discovery on February 14. Harris, Henry. 1999. “Howard Florey and the Development of Penicillin.” Notes Rec. R. Soc. Lond. 53(2):243–252. The Nobel site with information on Fleming, Florey, and Chain. Greenwood, David. 2009. Antimicrobial Drugs: Chronicle of a Twentieth-Century Medical Triumph. Oxford University Press, 88. Hare, Ronald. 1979. “Penicillin—Setting the Record Straight.” New Scientist 81(1142):466–68. Hare, Ronald. 1983. “The Scientific Activities of Alexander Fleming Other Than the Discovery of Penicillin.” Medical History 27:347–372. Lightman, Alan. 2010. The Discoveries: Great Breakthroughs in 20th-Century Science. Random House Digital.